The Canon PowerShot SX100 IS is an 8 megapixel digital camera with a 10x optical zoom lens – equivalent of 36 – 360mm (with optical image stabilization). It has a large range of automatic and scene modes as well as modes that give more control to a photographer wanting to stretch the camera a little further with aperture priority, shutter priority and manual modes but also manual white balance and metering control. Additionally, the PowerShot SX100 IS digital camera comes equipped with 19 shooting modes, ranging from fully automatic to fully manual, and easily accessible through an SLR-style mode dial on top of the camera. Shooting modes include Full Auto, Program, Shutter-Priority, Aperture-Priority and Manual, as well as special scene modes including Portrait, Landscape, Night Scene, Sports, and Kids & Pets. Setting it apart from competitors, the PowerShot SX100 IS digital camera gives consumers interested in the ease of a point-and-shoot camera many of the technological advancements that are the result of Canon’s 70-year heritage as an imaging innovator. The “brain” of this new PowerShot camera is DIGIC III, the gold standard on all new Canon digital cameras. The DIGIC III image processor accounts for the camera’s higher performance levels, including faster start-up, faster autofocus and quicker shutter response times that leave long-lag competitors in the dust. The DIGIC III chip design improves image quality and offers more efficient power consumption, resulting in extended battery life under typical shooting conditions. With Canon’s new Genuine Face Detection technology, the camera can detect, lock-on and track multiple human faces in a scene. The Face Detection algorithm automatically prioritizes and selects faces and not simply the closest object (based on Canon’s Intelligent Scene Analysis/iSAPS technology). It will then optimize the focus, exposure and flash to ensure the best possible results. Using Canon’s Face Detection, photographers can keep up to nine forward-looking faces in focus at any one time no matter where they are within the image. The PowerShot SX100 IS digital camera also introduces an exclusive new function called Face Select and Track using the convenient Face Selector button. With this feature, when multiple faces are detected, photographers can select any individual face they want the camera to track. This feature is ideal for many shooting situations such as birthday parties or graduation ceremonies, where many people are present, but the photographer is primarily interested in just one of them. Working in concert with Face Detection, the SX100 IS’s “Red-Eye Correction” feature helps to detect and correct red-eye during playback mode. Images can be corrected automatically or manually while viewing photos on the LCD screen. All in all, Canon’s new Face Detection Technology makes for even easier picture-taking moments, helping users ensure in-focus smiles and accurately exposed faces. The extended zoom range of the camera makes optical image stabilization (OIS) essential. Canon’s lens shift OIS provides an effective antidote to camera shake, particularly at longer zoom focal lengths or during long exposures when even the slightest hand-held shake is magnified to picture-blurring proportions. Superior to electronic image stabilization systems that simply use software to mask movement, OIS actually shifts the lens proportionately to compensate for unwanted motion, making it easier to snap great images. The OIS found in Canon PowerShot digital cameras is based on technology originally developed for Canon’s renowned high-end professional EOS SLR cameras. The steady effectiveness is further enhanced when paired with the new “Auto ISO Shift” feature which, at the touch of a button, can automatically increase the ISO speed setting as required to maintain fast shutter speeds when shooting in low light conditions without a flash. As an added convenience, Canon PowerShot digital cameras also accommodate MultiMedia MMC memory cards, as well as standard SD memory cards and the new, high-capacity SDHC memory cards. This way, consumers do not have to carry around multiple memory cards in order to be able to continue to save those special moments during extended vacations or high-photo-taking adventures. Canon PowerShot camera owners can shoot uninterrupted. The PowerShot SX100 IS digital camera will be available in ever-classic, never goes out of style black or silver colors. 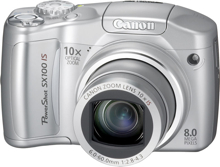 In stores beginning in October 2007, the PowerShot SX100 IS camera kit includes two AA Alkaline batteries, a 16MB MMC plus memory card, a USB interface cable, an AV cable, a neck strap, and Canon’s software suite at an estimated selling price of $299.99*.